My daughter is a reader! She amazes me. She loves her eReader, as well as paper books. The eReader is convenient for buying new books, and it doesn’t take up much space on her overflowing bookshelf. Without a library within 100 miles of our home, the eReader is the best solution for keeping her turning pages. Eight months ago, I shared with your our experiences with eReaders. At that time, her Kindle was new. As promised, here is an update on our eReader experiences. As mentioned previously, our experience with the first generation Nook was terrible. The device was extremely buggy, troublesome, and difficult to get to work as designed. It broke just two weeks after the warranty expired, and Barnes and Noble would not help us. Obviously, we did not purchase a new one; it was too great of a risk to try a newer generation Nook. Maybe we got a lemon, maybe we should have purchased an extended warranty…it doesn’t matter. Our Nook experience sucked, and we almost gave up on eReaders! The iPad is super cool; there is no doubt. We use it for everything except as an eReader. For children (and their parents), all of the other apps are a distraction from reading. The backlighting and graphics makes for more of a media experience rather than simply reading a book. It’s much flashier. 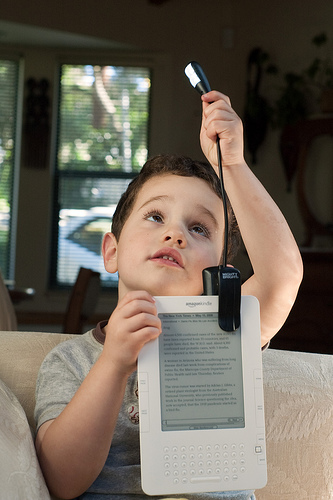 If your goal is to inspire your child to read more, the iPad is not the best choice. If your goal is have a multi-functional device, then the iPad is the winner. The Kindle is the best eReader for children (and adults). It works predictably and consistently. The battery lasts much longer than the iPad or Nook. Purchasing books is super easy whether from the device or on Amazon. It is durable, lightweight, perfectly sized, etc. It’s what an eReader should be. When we traveled to Italy this summer, we even saw Italian children reading on Kindles on the trains, not Nooks or iPads. Of course, there are other eReaders on the market, but we would recommend the Kindle for your child hands down! Reliable, easy to use, and dedicated just to reading, it is sure to inspire your child to read more! So I take it that you haven’t even tried the new Nook Touch device? If not, then how can you say the Kindle is the best eReader for kids when you haven’t even tried its major competition? For example, the new Nook offers battery life that is superior to the Kindle. NO, I have not tried it as I disclosed. Barnes and Noble treated my family disrespectfully and after spending countless hours on the phone with them to make the device work before it broke, I would not support the company again. We don’t even buy books there anymore. Interesting thoughts that I wouldn’t have considered. With your previous poor experience with the first Nook did that put you off comparing it with the new dedicated Nook eReader? Yes, after my experience with Barnes and Noble tech support and customer service, there was no way I would risk financially buying another Nook. I actually think the Nook Color may be better than the Kindle. The Nook Color has a bunch of features that are specific for kids. Of course, it’s heavier and more expensive. And I also think the touch screen (Nook Touch or Nook Color and now the Kobo Touch) would be good for kids to improve hand eye co-ordination right? Having said that I can totally see why you think the Kindle is the best. I too have both a Kindle 3 and an iPad and I hardly use the iPad2. The Kindle weighs half as much and easier on the eyes although I don’t use it at night because I don ‘t have one of those lighted covers! You just sound a bit bitter. I’ve only had great B&n Experience and terrible Kindle support. That is why we switched. The new nook is so far the best device and the kids love how easy it is to use. No more clunky keyboard in the way. Don’t let 1 bad experience turn you against an excellent product. I get bad service every day but I blame it on the person, not the company. I spoke to many customer service agents during the 12 months we had our Nook. It was not just one person. I am glad you are having a good experience with your Nook. This post was written as an update to an earlier post. It is based on our experience, obviously, instead of just writing about products without first hand knowledge. That is why I didn’t talk about the new Nook. I want to buy my 6 yr old grandson a kindle for Christmas, wondering if any of you have had experience which would be the best one to select, the kindle fire which would mean his books would be in color (maybe hold his interest longer?) or the kindle touch which I have and love. thank you!!! 2. Now with my new kindle fire i started it up and tried to connect it to my at home wifi. Wouldnt work so i called agin and finally figered it out. 3. I had had my Kindle Fire for a wail but i started to notic it was getting super hot. And then it powered off. Wouldnt turn on. At this point i was done i sent it back and got a refund. I used this money t buy the nook color which i have had no problems with so far. I still am very dissapointed with the kindle and the kmdle fire. It seems that e-readers have a long way to go to be reliable. I’ve read many reviews about the Nook with many unhappy customers, especially with B&N customer service. I had a Kindle and it broke a few weeks short of its 2nd birthday. A friend of mine had hers crash a few months after the warranty expired. I decided after looking at both the Nook and the Kindle to get another Kindle. But, I got the extended warranty this time. I’m now looking for an e-reader for my grandson. I can’t figure out which one is best for a 9 year old. That is how I got to this site. Has anyone used the Kindle Paperwhite? We have had only Nooks 1st gen, touch and touch light. My boys are 13 and take them to school. We have never had a problem with them except when something like a school book press against the screen and damages it. B & N will replace damaged screen if it under warrenty. If the replacement gets broke they will not replace it. We currently have 4 Nooks in my house and had to replace 4 because of damaged screen due to school books. I think any ereader would be good but i would also spend the extra money on an otterbox to protect against drops and protect the screen.